There is no stopping this comedian’s witty talk. 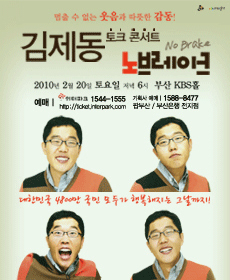 Korea’s most beloved and wittiest comedian Kim Je-dong is hosting a concert filled with funny anecdotes, insightful observations, and biting social criticism. This talk concert will be a combined effort of Kim, his special guests, and a responsive audience. Don’t miss this inspiring and amusing parade of talk.